Can goats save tax dollars by replacing mowing crews? PITTSBURGH — Porcelain berry vines have invaded the hillside here on the edge of the city’s West Penn Park, strangling native plants and trees and threatening to take over the park. The City of Pittsburgh doesn’t want to use herbicides to clear the fast-growing invasive plant. And pulling the vines out by hand may expose workers to poison ivy and thorns. But a new contracting crew has just the appetite for the job. Cowboy, Twinsie and eight other goats owned by Steel City Grazers will hoof it through West Penn and two other city parks all summer, eating the vines and other weeds to make room for native plants to grow. And Pittsburgh isn’t the only city or state where goats are being enlisted by government this year. They are being called on to munch on buckthorn in Minneapolis, nibble on English ivy in New York City, and clear brush in Southern California. More governments are turning to goat grazing as they look for an environmentally friendly — and more cost-effective — way to nip noxious weeds in the bud. Nationwide, eradicating weeds costs taxpayers and private landowners $34 billion a year, a 2000 study found. Infestations of invasive plants reduce the amount of productive farmland, bring down property values, inhibit public utility operations, and harm the health of ecosystems, according to the U.S. Fish and Wildlife Service. More governments are turning to goat grazing as they look for an environmentally friendly — and more cost-effective — way to nip noxious weeds in the bud. In the last 20 years, city, county and state governments have leased goats in more than a dozen states. Through the trials, effective eradication programs have emerged along rivers in Iowa and a highway in Maryland. But although goats may be a greener option and may attract popular public interest, they don’t always prove their worth. Some local programs, such as one in Salem, Oregon, have ended up costing more than mowing, controlled burns and herbicides. Using goats seems simple: Get goats and place them near unwanted vegetation. But there is much more to consider — such as the time of year, whether they will eat the kind of weeds that need to be eradicated, the size of the area, the number of goats, how long they are needed, and fencing and caring for them — said Karen Launchbaugh, a professor at the University of Idaho who studies animal grazing for invasive species management. “You’ve got to know what you’re doing,” Launchbaugh said. Goats have proven most useful on steep or rocky hillsides, where workers would have trouble walking; in wetlands and stormwater management areas, where mowers don’t work or heavy machinery would damage the land; and on vast ranges or state parks, where mowing and spraying would be time-consuming and costly. Pittsburgh’s hilly landscape is a perfect place for the goats of Steel City Grazers to work, say Carrie Pavlik and her husband, Doug Placais, who founded the company last year. The company charges a base fee of $300 or more, plus $5 to $10 a day for each goat. (Smaller goats cost less because they eat less.) The company’s goats are working in the city parks this summer under a $10,000 grant that the Allegheny County Conservation District awarded to Tree Pittsburgh, a local nonprofit. During an eradication job this month, the goats grunted as they followed Placais around a park in Mt. Lebanon, just south of Pittsburgh. They gnashed on weeds, tree bark and the ground, spitting it up and then eating it back up again. The goats’ digestion process often destroys the plants’ seeds, so they won’t grow after they’ve been expelled. 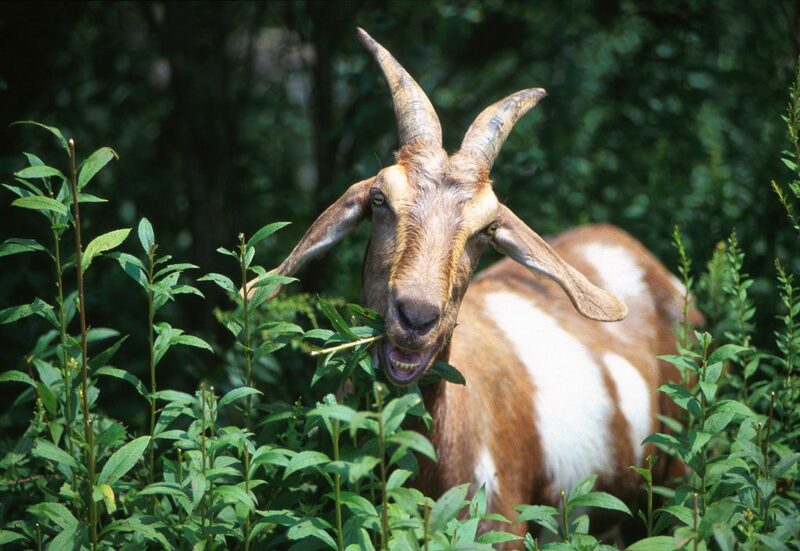 In Maryland, about 40 goats and sheep will spend their eighth summer eating invasive plants, such as multiflora rose, in a wetland along a state highway. Mowers are not an option because they would put ruts in the wetland and could kill the federally protected bog turtle, said Charlie Gischlar, spokesman for the State Highway Administration. The state program has seen success, albeit limited. The U.S. Fish and Wildlife Service still sprays herbicides on the area to control the weeds, and the state has had to rearrange fencing and animals to avoid conflict with the turtles. The state leases the goats and sheep for $5,000 a year, Gischlar said; which would be about the same cost as using other methods. If highway agencies use goats, the Federal Highway Administration advises them to contract with commercial grazers, decide the best time of year, provide safety signs, replant the area and monitor results. Preferring woody and weedy species, goats select the young growing points first as they browse downward from the upper parts of a plant. USDA photo by Scott Bauer. In Southern California, goats help protect the Ronald Reagan Presidential Library and Museum, in Simi Valley. Knee-high brush and weeds surround the library, which sits on the top of a hill. Each year, they clear the brush to make it more difficult for wildfires to spread. After four years of drought, the land in the area is dry, even with recent rain, said Heather Sumagaysay, a spokeswoman for the Ventura County Fire Department. About 450 goats arrived on the property May 9. And Sumagaysay said it would only be a couple weeks before “they clear the brush down to the nib.” The goats are less expensive than having firefighters do the work, she said. The goats will cost about $11,570. Manual labor would cost about $54,400. Goats also just arrived Monday in New York City’s Prospect Park, where they have been tasked with eating English and poison ivies. They will be in Minneapolis parks soon, eating buckthorn and other invasive plants. Goats are not always cost-effective. Salem, Oregon, wouldn’t use them again in Minto-Brown Island Park, said Mark Becktel, the city’s public works operations manager. Traditionally, the city would have used inmate labor or mowing to eradicate the park’s Armenian blackberry and English ivy. Instead, it brought on 75 goats for six weeks in October and November to clear the mostly flat, 9.1-acre area. The goats got the job done. But they also ate native plants and damaged maple and hazelnut trees, and inmates had to come in and clean up afterward. And there was the high cost. The city spent $20,719, much more than the $3,370 to $4,245 it would have spent using mowers or weed eaters and inmate labor. 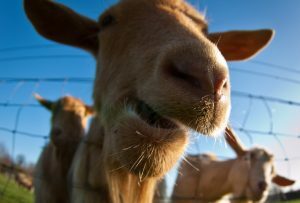 Although most governments lease goats from contractors, Portsmouth, Virginia, bought 10 of them in the summer of 2013 to trim grass at a landfill, later adding some sheep. Since then, four goats died, two from parasites and two from being crushed as babies by their mother, according to The Virginian-Pilot. As of December, the Pilot reported, the city still owned some of the goats, costing it nearly $2,000 a year, and there was still high grass in the 120-acre plot at the landfill. Denver also encountered problems using goats in an urban environment, according to an American Association of State Highway and Transportation Officials’ report. Many governments will try out goats before committing to them. And that’s probably good policy, as Washington state discovered. Although goats were successful and cost-effective in eating weeds in a fenced stormwater facility in Vancouver, Washington, they didn’t do so well clearing unwanted vegetation along a roadside in Olympia and a freeway in Spokane last summer. And the costs were higher, said Barbara LaBoe, spokeswoman for the Washington State Department of Transportation. In northeast Iowa, about 60 goats spent the last two years grazing on invasive plants on 8 acres along streams in parks and wildlife management areas. When it comes to controlling vegetation, normally “it’s cow pow, ax, or match,” meaning using cattle for grazing, manual labor or controlled burns, said Mike Steuck, a fisheries supervisor for the state’s Department of Natural Resources. But the goats did good work, and they cost the state about the same as using manual labor: $1,500 the first year and $2,000 the second year. If the weeds grow back less quickly after the goats, and the state doesn’t have to manage the land as often, then it will continue to use goats, Steuck said. The key, Launchbaugh said, is not only monitoring a program’s success, but committing to a long-term maintenance plan that may combine goats with manual labor and herbicides. In Pittsburgh, the weeds are hardy, said Mike Gable, director of the city’s Department of Public Works, stepping on a shoot of Japanese knotweed, another invasive plant that is spreading quickly in West Penn Park. The goat program fits perfectly with the city’s goal of reducing its use of herbicides, Gable said. If it works, the city may consider spending its own money on it.